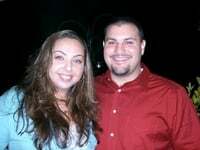 Hi my name is Regina and my husband is Andrew, and we got married on September 30, 2006 in Hoboken, NJ. We honeymooned at the Grand Velas in Nuevo Vallarta from October 5-11,2006. We were nervous about booking a honeymoon in the Caribbean because of hurricane season. After looking at Hawaii and different cruises, I researched Mexico. We have some friends that recommended Cabo San Lucas. It took a few months of research and waiting to find an ideal package. I stumbled upon the Grand Velas located right near Puerta Vallarta, and booked the trip through the American Airlines Vacations website. However, we did need to keep the honeymoon affordable, since we were also paying for our wedding. This was another reason we decided to forgo the traditional registry and registered at TravelJoy for the honeymoon. The registry definitely helped us be able to enjoy everything that the resort and Puerta Vallarta had to offer. The Grand Velas was an amazing resort, I would highly recommend to all honeymooning couples in search of a relaxing, beautiful, top-notch all-inclusive resort. It was all in the details of the service, from the superb house keeping, to the little pink flowers that are added to the folded towels on your pool chair. You never had to ask for anything twice, and when you just thought you needed something someone would just appear as if by psychic power! The best part was the magnificent infinity pool (3 pools linked). You can just lie in the water and sip your drink, while waiters walk by and ask you if you need something else. The rooms were tremendous, we joked that it was larger then our one bedroom apartment. The food was great, never felt like an “all-inclusive” buffet, with choice of specialty restaurants, poolside food service, room service was practically 24 hours, and a stocked mini bar was also already included in the cost of your room! The spa was fantastic, with great services, definitely recommended. The only thing we didn’t love was their beach, which is something the hotel can’t control. We just prefer the water and sand in the Caribbean. Puerta Vallarta is a fun place, yet you don’t feel pressured to go out and feel like you are missing out if you just stay at your resort. We did go on two wonderful excursions, Marietas Snorkeling Tour and Swimming with Dolphins. Both of these excursions made our trip. My husband still reminisces about swimming with the dolphins, and how wonderful they made you feel. The snorkeling trip was really fun, but a bit long. I would have done more of a half day, so I could go back and enjoy the pool at the resort. Over all our honeymoon was exactly what we wanted. We spent approximately $3,500, plus received $2,460 from our Traveler’s Joy registry, which allowed us to pay off some of the trip, go on excursions, get pampered, and upgraded to first class (using miles and fee). I would highly recommend the Grand Velas for anyone that is looking to have an ideal vacation or honeymoon. It is hard to find a resort with such excellent service, beautiful grounds, immaculate rooms, and general understanding of the true meaning of worry free vacation.